Price trumps all in airline economics, which is why United has scrapped an order for 10 new 787s in order to buy an equal number of older, larger, less-fuel-efficient airplanes. United Airlines loves the Boeing 787 Dreamliner. It became the first U.S. carrier to fly the long-haul jet and takes every opportunity to proclaim the Dreamliner’s passenger-friendly features and attractive operating costs. Yet price trumps all in airline economics, which is why United has scrapped an order for 10 new 787s in order to buy an equal number of older, larger, less-fuel- efficient airplanes. The switch to 777-300ERs comes as happy news for Boeing. The manufacturer has been desperately seeking more orders as it transitions to a complete update of the plane with the 777X, which is scheduled to enter commercial service in 2020. United’s decision to ditch Dreamliners was driven by two primary factors. First, Boeing’s 777 production line is only 50 percent filled in 2017, with even more open slots the following year. Boeing has collected 25 orders for the 777 this year, about half its goal. Second, the collapse of jet-fuel prices makes a jumbo jet like the 777 far more attractive. United’s fuel bill dropped more than 36 percent in the first quarter from the same period of 2014 — a decline of more than $1 billion. Boeing also plans to shed about 1,200 pounds from 777s by late next year, along with further aerodynamic improvements, which will offer about 2 percent more fuel efficiency. Boeing was also keen for the aircraft swap due to a shortage of delivery slots on the 787 production line. Airlines looking to take possession of new planes sooner are eager to move ahead in the delivery queue whenever possible, and Boeing is now gearing up to deliver the largest 787 model, the 787-10, in 2018. “We’re still a big believer in the 787,” John Rainey, United’s chief financial officer, said Thursday on an earnings call with analysts. He said the 777-300ER is better for some markets than the 787, given its larger capacity. The new 777 is likely to be deployed at United’s Newark, N.J., hub, from which the airline flies to several Asian destinations and five times daily to London Heathrow. United officials declined to comment on its discount for the order, as did a Boeing spokesman. The airline also declined to specify which of two 787 versions it had scrapped in the change. United has 17 787s in its fleet, with 38 still to be delivered. The airline was also the launch customer for the 777, which it first ordered in 1990, and now has 74 of the planes in its fleet. It will become only the second U.S. airline to fly the 777-300ER. For several years, the 777-300ER has served as the financial bread-and-butter in Boeing’s widebody production line. Pricing for the popular airplane, which can carry as many as 386 people up to 7,800 nautical miles, “was about the best in the industry,” Aboulafia said. Boeing offers discounts of only about 40 percent off the plane’s $330 million list price, he added, better than other widebody models in the industry. With the slowing order book ahead of the new 777X, Boeing’s discounts on the 777-300ER have moved closer to 50 percent and higher in some deals, he said. 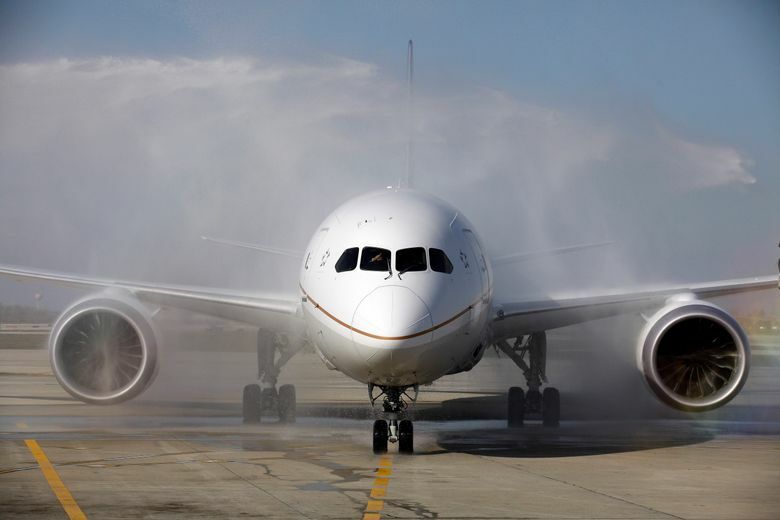 The 787 order swap is part of a larger fleet revamp at United, which is culling 50-seat regional jets from its fleet in favor of 76-seaters as quickly as possible and reconfiguring 10 of its international 777-200s for domestic service, for flights between its hubs and to Hawaii. United also will keep flying 21 767-300s longer than expected, moving them to trans-Atlantic service to replace several 757s, which will move to Latin America. On westbound flights, the 757s used on European routes regularly need to stop to refuel during winter due to high winds.